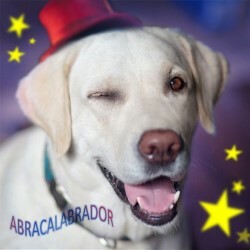 Join three-time Magicians’ Circle Very Good Boy nominee Rory the Retriever as he delights and surprises with his magical repertoire of tricks and illusions. Featuring new and inspired takes on traditional classics like The Unthrown Tennis Ball, Mystery Noise and Which Hand’s the Treat In? ‘Astounding!’ (Audience review). ‘So good I wanted to roll in it' ***** (Poodle Reviewdle).